اطلاع‌رسانی سرگرم‌کننده که به نحوی فزاینده در حال تبدیل‌ شدن به یک پدیده مهم در عرصه سیاسی و رسانه‌ای دنیاست، در سال­های اخیر در تلویزیون‌های فارسی‌زبان نیز رواج پیدا کرده است. در این مقاله به گونه‌شناسی ساختاری و محتوایی شش برنامه «شبکه نیم»، «دکتر کپی»، «آنتن»، «پارازیت»، «صرفاً جهت اطلاع» و «حساس نشو» در سه رسانه من‌وتو، صدای امریکا و صداوسیما با استفاده از روش تحلیل محتوای کیفی پرداخته شده است. بر اساس نتایج تحلیل، سه گونه کلان ساختاری قابل ‌تفکیک است: سرگرمی‌محور، اطلاعات محور و ترکیبی. این برنامه‌ها اجزای ساختاری مشترکی نظیر استفاده از ادبیات خودمانی و پیگیری آگاهی‌بخشی در قالب‌های غیر سرگرم‌کننده دارند. به لحاظ محتوایی نیز سه نوع گونه‌‌شناسی قابل ‌ارائه است: نوع جهت­گیری سیاسی و انتقادی، سطوح نقد و میزان توجه به جنبه‌های ساختاری و ریشه‌ای و میزان پیگیری موضوعات غیرسیاسی. این برنامه‌ها به‌طور عمده، ویژگی‌های محتوایی مشترکی نظیر توجه و تأکید بر مشکلات اقتصادی و رفاهی مردم و توجه و تأکید بر رفتارهای نادرست و سخنان متناقض مسئولان کشور دارند. 2Communication Sciences, Allameh Tabataba'i Uni. Infotainment which is increasingly becoming an important phenomenon in the political and media world, has also become popular in Persian language television in recent years. 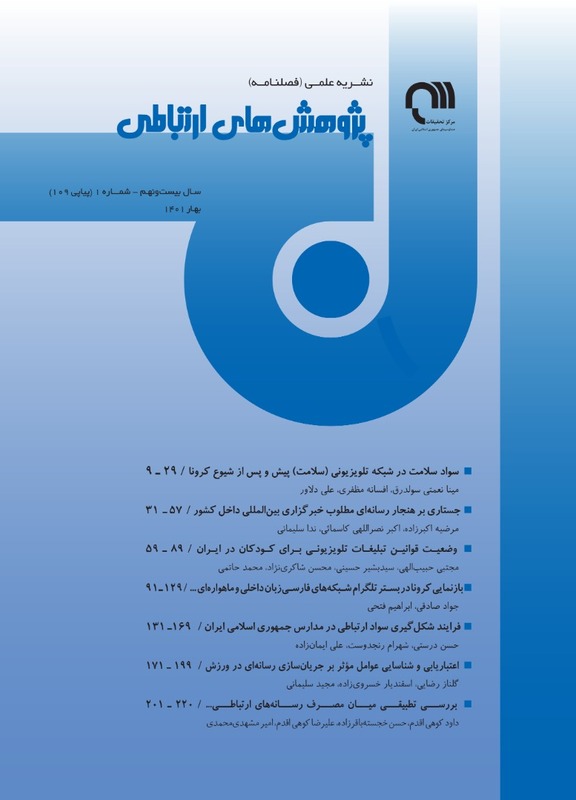 This research studied the structural and content typology of six programs (Shabake Nim, Doctor Copy, Antenna, Parasite, Serfan Jahate Ettala, Hassas Nasho) in the three TV channels Manoto, VOA, and IRIB television using qualitative content analysis method. Based on the results of the analysis, three macro-level structural types can be distinguished: Entertaining, Informing, and Hybrid. These programs have common structural components, such as the use of intimate literature and pursuit informing in non-entertaining genre. Three types of typology can be presented in terms of content: The kind of political and critical orientation, the levels of criticize and attention to the structural and basic aspects, and the extent of pursuing non-political issues. These programs, in general, have common content features, such as emphasize and paying attention to the economic and welfare problems of people, and the wrong behaviors and contradictory words of the country officials. توسو، دایا کیشان. (1388). اطلاع‌رسانی سرگرم‌کننده جهانی به‌منزله ایدئولوژی. فصلنامه جهانی رسانه، 4 (1). جعفری هرندی، رضا؛ نصر، احمدرضا و میرشاه­جعفری ، سیدابراهیم. (1387). تحلیل محتوا روشی پرکاربرد در مطالعات علوم اجتماعی، رفتاری و انسانی با تأکید بر تحلیل محتوای کتاب­های درسی. فصلنامه حوزه و دانشگاه، 55، صص 57-33. فرقانی، محمدمهدی. (1393). روزنامه‌نگاری، ارتباطات و جامعه. تهران: انتشارات اطلاعات. ویمر، راجر دی و دوومینیک، جوزف آر. (1384). تحقیق در رسانه‌های جمعی (ترجمه کاووس سید‌امامی). تهران: سروش. هاشمیان ادریانی، سلمان. (1392). مطالعه‌ کاربرد سبک «خبر ـ سرگرمی» در گزارش‌ها و اخبار برگزیده بخش خبری 20:30 شبکه دوم سیما. پایان‌نامه کارشناسی ارشد ارتباطات، دانشکده صداوسیمای تهران. Alonso, P. T. (2012). Satiric Infotainment TV Shows (American Jon Stewart, British Sacha Baron Cohen, and Peruvian Jaime Bayly in Perspective), A Dissertation for the Degree of Doctor of Philosophy in the University of Texas at Austin. Baym, G. (2008). Infotainment. in W. Donsbach (Ed), Encyclopedia of Communication (Vol. VII), London: International Communication Association/Blackwell Publishing, Pp. 2276- 2280. Berg, B.L. (2001). Qualitative Research Methods for the Social Sciences. Boston: Allyn and Bacon. Boukes, D. M. (2015). Spicing up Politics: how Soft News and Infotainment Form Political Attitudes, A Dissertation for the Degree of Doctor in University of Amsterdam. Brants, K. (1998). Who’s afraid of Infotainment? European Journal of Communication, 13, Pp. 315–335. Collier House, K. (2011). The View from the oval office: The Audience Effects of Presidential Appearances on Entertainment Talk Shows, A Thesis for the degree of Master of Arts in Communication, Culture, and Technology, Georgetown University. Corner, J. (2000). Documentary in a Post-Documentary Culture? A note on Forms and their Functions. Changing Media – Changing Europe programme. European Science Foundation, Working Paper, No. 1. DeLauder, R. C. (2010). Political Entertainment News in the 2008 Presidential Campaign, A Thesis for the Degree of Master of Arts in Communication, faculty of the Virginia Polytechnic Institute and State University. Delli Carpini, M. X. & Williams, B. A. (2001). Let us infotain you: Politics in the New Media Environment. in W. L. Bennett and R. M. Entman (Eds. ), Mediated politics: Communication in the Future of Democracy, Cambridge, MA: Cambridge University Press, Pp. 160–181. Grabe, M. & et al. (1998). Explicating Sensationalism: Content and the Bells and whistles of form Association for Education in Journalism and Mass Communication Conference Papers. Grabe, M. & et al. (2000). Packaging Television News: The Effects of Tabloid on Information Processing and Evaluative Responses. Journal of Broadcasting & Electronic Media, Vol. 44, No. 4, Pp. 581-598. Hsieh, H-F. & Shannon, S.E. (2005). Three Approaches to Qualitative Content Analysis. Qualitative Health Research, Vol. 15, No. 9, Pp. 1277-1288. Larris, R. J. (2005). The Daily Show Effect: Humor, News, Knowledge and Viewers, A Thesis for the Degree of Master of Arts in Communication, Culture, and Technology, Georgetown University. Ortells-Badenes, S. (2014). Journalistic News Values in Infotainment Programmes. Textual & Visual Media, 7, Pp. 85-96.